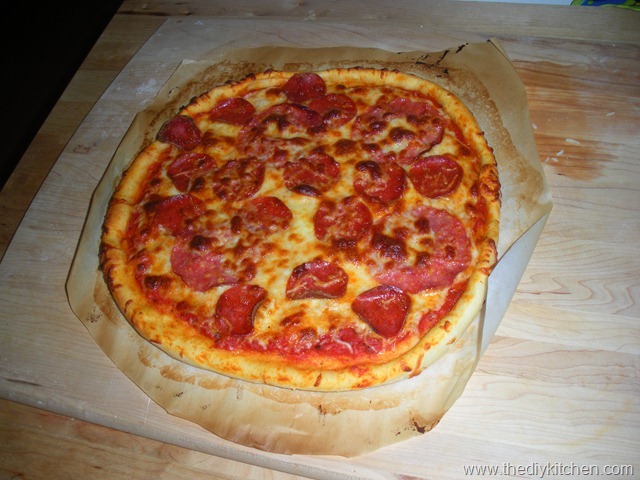 A few years ago Mrs. DIY Kitchen and I took a bread making class and for lunch we worked up this quick and easy pizza dough. We’ve been using this recipe and making pizza at home ever since. Because you do need to let the dough rise, it does take a little advance planning. 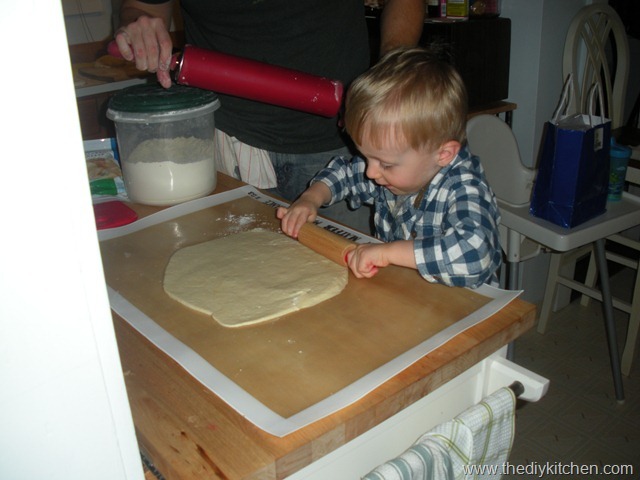 Also, it’s a great activity for getting kids in the kitchen. Start with 1/2 cup warm water, 1 tbsp yeast and 1 tbsp sugar. Mix and wait until the yeast wakes up and starts getting foamy. Next add 1 cup water, 1 1/2 tsp salt, 2 tbsp olive oil, 2 rounded tbsp gluten flour and stir. 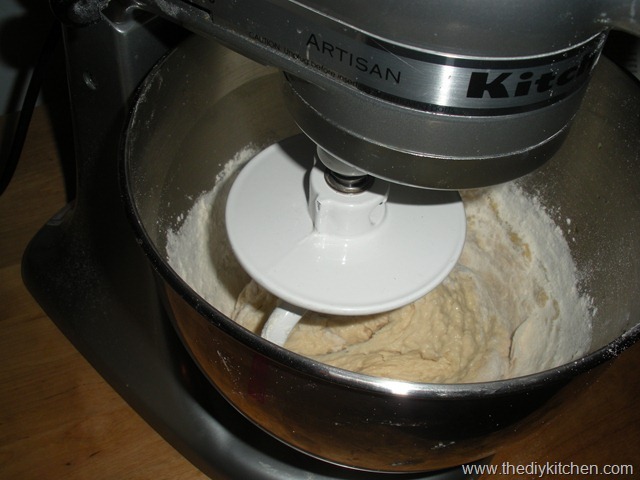 Add about 2 1/2 to 3 cups of white flour and start mixer on low with the dough hook. After ingredients have mixed together, add another 1/2 to 1 cup of white flour and let the mixer run until the dough is smooth, about 10 min. 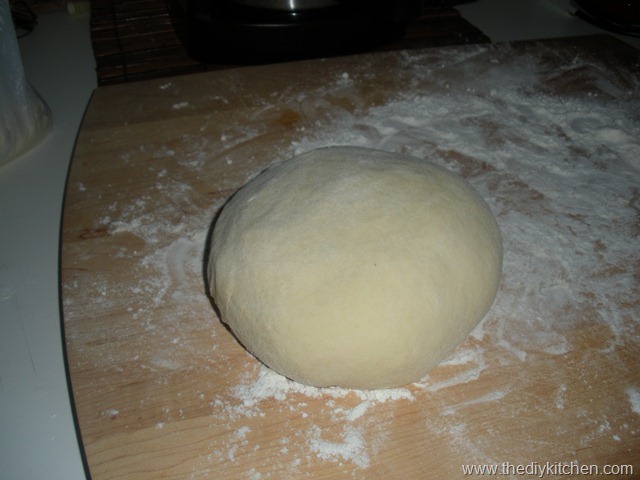 Turn the dough out to a floured surface and form into a rounded ball. 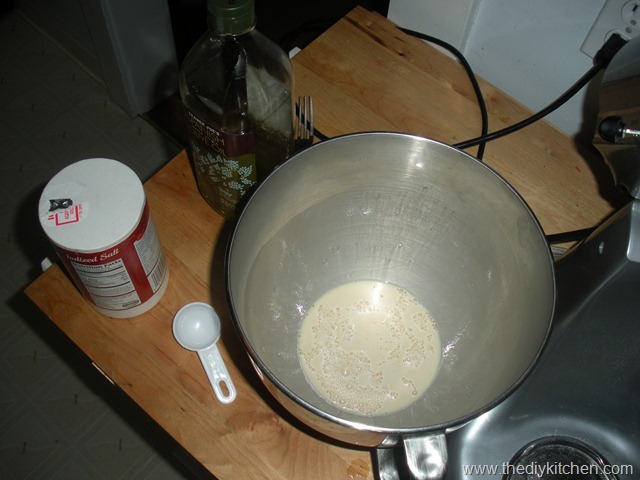 Place the dough into a bowl coated with non-stick spray, cover and allow to double in size in about 90 minutes. Punch down the dough, divide in two and you’re ready to roll out your dough. I use a pizza stone on the middle rack preheated in the oven at 500 for 30 min. before putting the pizza in the oven. I like to place the dough on parchment paper and then slide on and off using a rimless baking sheet. After about 10 min. in the oven, here’s the result. Yum. I want to eat that. I have aspirations of making this for dinner tomorrow night! Your dough recipe looks nice and easy (and delicious).